The Tipperary Volunteer Centre will be hosting a series of Pop-up Volunteer Centres around the county this year. They will be based in Templemore this coming Monday 1st to Friday 5th of April between 9.30am and 4.30pm. 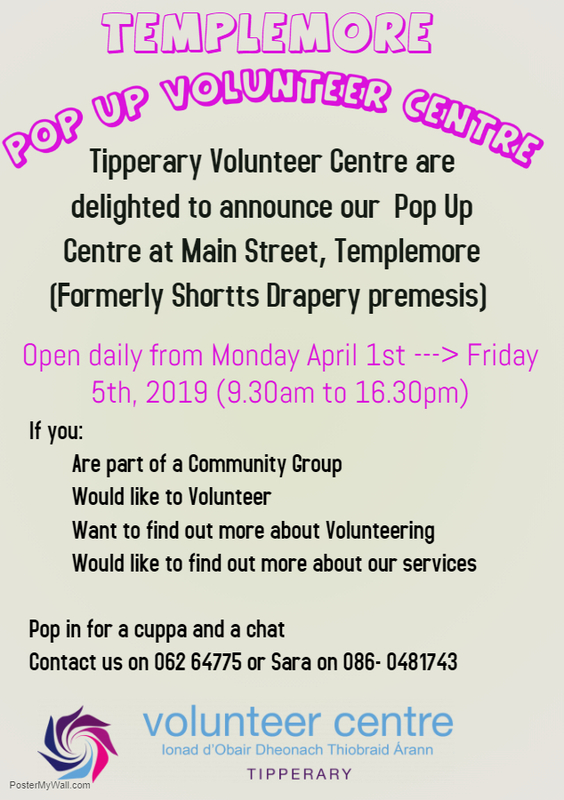 The Pop Up Volunteer Centre will be located on the main street in Templemore in the former Shortts Drapery premises. The idea behind the Pop-Up Volunteer Centre is to make it easy for individuals and community groups to meet with the staff of the Tipperary Volunteer Centre. They can help individuals find suitable volunteer roles and help community groups recruit and retain volunteers. Members of the volunteer centre will be there all week to meet with the public. On Friday 5th of April there will be a coffee morning held in the Pop Up Volunteer Centre between 11am and 2pm. The Volunteer Centre would like to welcome any individuals and community groups along to the coffee morning as a chance to network and get information about volunteering in Tipperary Templemore. We would love to meet organisations and members of the community in Templemore next week. We would encourage anyone thinking of getting involved in volunteering to pop in and have a chat with us about your volunteering interests. We will do our best to help to create more volunteering ‘matches’ between potential volunteers and community groups in their area.